If you decide to use 2-Liters, fill them 1/2 to 2/3 of the way up with water and put the lid on tight. If you’re inside, be prepared for an explosion of water if you have someone who can launch a turkey! Next up, tape or cone off your lanes. Make sure to leave some distance between the lanes so that you don’t have a lot of cross traffic. You will also need to determine the distance between the bowlers and the pins. Do some trial runs, because it will depend on the surface you’re playing on. Twenty feet might be perfect for some, but others will find it far too close. 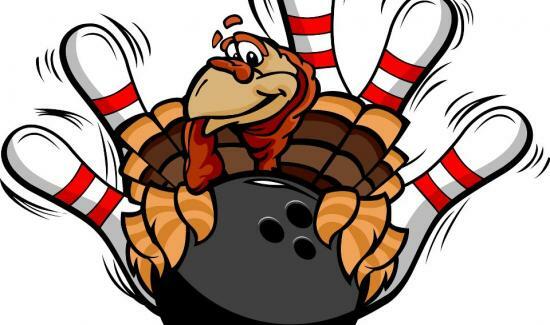 Once it’s all set up, explain that the rules will be just like bowling, except you will be using a turkey instead of a bowling ball. We recommend having different size turkeys to accommodate the size of your participants. The game is easiest to play if you have ten participants per team, but you can make the teams smaller or larger based upon how many lanes you have and how long you play. Make sure to keep score for each of the teams and declare your Turkey Bowl winner to the highest scoring team! Play Ultimate Turkey Bowl by taking all the pins from every lane and creating a “super lane”. Much like Wii Bowling, you can create a lane with extra pins. Make sure to use a number that will set up right (i.e. 15, 21, 28, 36, 45, etc.). While you’re not supposed to bowl multiple balls at a bowling alley at the same time, you can do it here! Have two or more people toss their turkeys simultaneously to see how many pins they can knock down. 1. Have a backstop if you’re inside! Oddly enough, frozen turkeys can pick up a fair amount of speed, so you’ll need to make sure they don’t leave a mark on your wall. 2. Take plenty of video & pictures to capture your event and put them on FB, Instagram & your website. Make sure to tag people as well so their friends will see all the fun you had. 3. Have staggered starting points for bowlers if some of your participants are having a difficult time getting the turkey down your lane. 4. Place tarps down to create lanes. This will keep things cleaner and depending on your surface, it may help the turkey move a bit easier. If you do this, you can also grease your turkey with some Crisco!